NOTES: This is Phil Hughes season debut and also the rubber game vs the Angles. All three of the Yankees series have been split to 1-1 and the Yankees have won the last game everytime so far. Hopefully they can keep it up! "I'm looking forward to the 15th. It's the first step of this year, and I'm looking forward to starting off well and keeping it going." "I don't think I'm done working on it, it's never a finished process. I still feel like I can mature and throw my pitches in different scenarios, different counts. Now, with four pitches, I can really pitch." If what he did last year wasn't really pitching then this year is going to be interesting. I'll be making my getaway to New Hampshire to spend some time with the family tomorrow. So, this was the last game I'll be seeing for the rest of the week. It was a good one though. A.J. came out of the gate throwing heat. He was thrwoing 95-97 mph consistently and it served him well early on. When that started to fail him, he turned to a vicious breaking ball. Although the score was close, the way Burnett pitched made it feel like the lead was much larger. He's been fantastic since that start against Boston and I pray he stays healthy because right now A.J. is a guy worth watching every start. He K'd seven in as many innings and gave up only two runs. Much of that was due to the fact that he limited his walk total to three which is a major improvement for Burnett. He was challenging hitters, rather than nibbling and the results were fantastic. The bullpen was just as good as well. The two Phil's worked together for an easy eighth inning and Mariano had a 1-2-3 ninth inning while K'ing two. The offense didn't score to many runs but were solid and four runs sould be enough to win a game. Cano opened up the scoring by leading off the second with a homer. Its been a long time since Robi's flashed his power. It wasn't that long ago that some people were talking about 30 home run potential with him and its nice to see him show some of that again. The fifth inning was what sealed the deal. Brain Tallet started the inning by walking Brett Gardner, big mistake. The Toronto lefty was clearly distracted by Gardner throughout the rest of the inning. He ended up walking Mark Texeira with the bases loaded and throwing a wild pitch to give the Yankees a 3-1 lead. Vernon Wells got the Jays a run closer in the following inning with a solo homer but that was all they would get and A-Rod would tack on another run with a ninth inning homer off of Jeremy Accardo anyway. Great bounceback win after a clunker by Sabathia and the Yankees are rolling right now. No this isn't a post about Joba. It actually has nothing to do with him. This is about me wondering why Brian Bruney is still be trusted with that critical inning while Phil Hughes gets mop up duty, cleaning up other guy's messes. Bruney was a revelation back in April but since then has not been the anchor that we've been waiting for. As a result of his struggles his ERA has shot up to 3.94. His FIP is still low but not what it was a week or so ago. I'm hesitant to throw Bruney right into the fire immediately after returning from his injury. Meanwhile Phil Hughes has been trending the opposite way. As a starter he has mixed results. Some great starts, others were mediocore, and he has that one awful one that caused his ERA to balloon. Since switching to the bullpen he's been nothing but great. His numbers are all solidly above average now. His K/BB is well over 2.00, his ERA is 4. 34, and his FIP is down to 4.43. Take out that one awful start and his numbers easily match Bruney's. Still, for whatever reason he's not being entrusted with key innings. Their are some very strong arguments for moving Hughes back to AAA, chief among these is the argument that if he doesn't build up his innings total, his innings limit next year will prevent him from moving into the rotation for the whole year. I believe that its worth that small sacrifice to take advantage of his dominating pitching out of the bullpen right now. However, if he's not going to be trusted with big innings then why bother keeping him here? I'm skipping the recap today. Noboy really wants to rehash that game. Instead I'm going to focus on Wang and Phil Hughes. Wang put together his second consecutive good outing and has probably earned himself a little bit of breathing room. Not that five innings, three runs is anything to get excited over. However, considering where he was a couple starts ago its a major step forward. He was at around 60 pitches when he came out and its conceivable that if they weren't playing in the National League, he would have gone seven or eight innings. Not that it would have mattered in the end with the Yankees floundering offense. If he gets crushed in his next start he might be forced out of the rotation but he seems like he's figured things out and might be back to pitching like the old Chien Ming Wang. Yet again, his next start is going to be a big one to see if he can follow up on his success. Hughes also pitched extremely well again. I'm sure he's keeping Wang on a short leash. He's been just dominating and his numbers are all around very good. Its only a matter of time before somebody gets hurt and Hughes finds his spot in the rotation. I don't think Phil is ever going back to Scranton at this point. He's been the rare bright spot during the Yankees downward spiral. 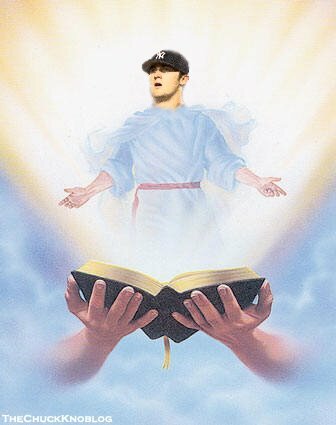 Desperate times call for desperate measures, tonight during Joba's start we will be resurrecting the liveblog. I assume we'll start around game time, 7:00. Feel free to join us. It doesn't seem like these Yankees ever really have normal games. Its always either a dramatic comeback win or as painful a loss as they can make it. Wang pitched fine for once. He kept the Yankees in the game and I assume he will get another start (against the Braves?) but I already adressed Wang's performance. The bullpen also came through big. Phil Hughes continued to establish himself as a reliable bullpen arm with another two shutout innings. In the bullpen he can rely solely on his fastball and curveball rather than being forced to rely on his weaker pitches like his changeup and cutter. So that's it for the pitching, the real problem was the incredible lack of offense. For the first eight innings nothing happened. Robinson Cano (who may be starting to heat up a bit) hit a solo homer for their only run but besides that they didn't give Yankees fans much to root for, A-Rod got some boos but that's not even notable anymore. Of course, as these Yankees always seem to do. They came alive in the 9th. Johnny Damon led off the inning with a home run to bring the score to 3-2. Thus waking up all of the sleeping Yankee fans at the stadium and nearly inciting a comeback win. Mark Teixeira hit a single with one out and Brett Gardner pinch ran for him. After two stolen bases Gardner ended up on third for Alex Rodriguez with only one out. Instead of getting teh walkoff home run everybody at the stadium was expecting though, he works a walk. Setting up a game ending double play from Robinson Cano. Another ugly loss but at 1:00 today they have a chance to reverse that. Win today and everybody forgets about it. One of the quiet signings that Cashman and co. made last winter was Sergio Mitre. Back when they first signed him I made a post saying he had some potential to be a solid fill in for them. Well, now with Pettitte and Wang both struggling and Ian Kennedy hurt their may be a need for him. He was suspended for violating the PED policy for the first chunk of the year but now he's pitching for Scranton. His first start was excellent and if the rotation continues to have problems, look for him to get a call-up. Do the Yankees actually plan on using Hughes in the bullpen? Its been seven days since he last pitched and it doesn't seem like it. If they're not going to use him then why bother leaving him up in the ML's? This was a big start for Hughes with the spectre of Wang hanging over him and he delivered in the best way possible. Obviously the offense also murdered Texas pitching but Hughes was the story yesterday. I was particularly impressed by his 3 straight K's to get out his only jam of the day. Also Bruney is going on the DL and Robertson will come up to replace him. According to numerous sources Phil Hughes is making his return to the Bronx as a replacement for Chien-Ming Wang. Two years ago Hughes wowed the majors coming into the league throwing smoke. Last year the Yankees were counting on Phil in the rotation but injuries prevented that. He is scheduled to start Tuesday against fellow youngster Edwin Jackson. With the pressure off him, I expect a stunning performance on Tuesday. You also have to remember that Hughes is only 22 which gives him a lot of time to grow. "Hughesie's been throwing the ball really well,"
He doesn’t have the arm strength he had last year,” Contreras said. “But he hasn’t pitched in eight months prior to this spring training. What I saw today, he had the best slider I’ve seen since I’ve known Chien-Ming. The slider has improved and the changeup is very good. His offspeed pitches are coming in really well. Phil Hughes (right) struck out seven batters tonight: Two on fastballs, one on a cutter and four on a curveball that was much improved from his previous two outings. Hughes said he's been focused on the curveball during his side sessions, and felt like he got the feel for it heading into this start. It was sharp, and he was willing to throw it in just about any count, including three-ball counts when he needed to drop it for a strike. If Hughes' curveball is truly back to where it was in this game, I think he will contribute immediately. A-Rod is caught up in yet another stripper themed scandal. Girardi says that "If we were to break today, Nady would be my right fielder,"
A-Rod wants the other 103 names should remain anonymous. Yankees fall behind the Phills 5-2 after playing 6. Hughes is chilling in triple A, for now. The Yankees have released the concessions changes for the new stadium. Likes: Johnny Rockets, Garlic Fries and Boars Head meats; Dislikes: Pepsi is now served over Coke, Blasphemy! 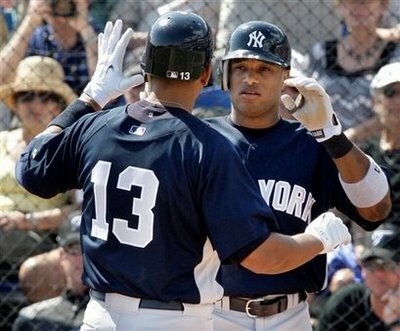 A-Rod and Gardener both hit homers. Veras gave up the one run but he got the win. Thank god the Yankees didn't trade for Johan Santana last winter. Just so you know, I checked the 2008 stats three times and they are correct. If you`re suddenly doubting the validity of this stat then I`d like to note that I did predict Barry Zito's sudden collapse using this stat. This guy has been steadily declining since 2006. In fact, a quick glance at the stats shows that even 2006 was a drop-off from the previous year. In fact, every year has been inferior to his first full year in 2004. So why? He`s still pretty young. Maybe it has something to do with the ridiculous amount of innings he`s thrown each year. Anyway, since 2004 his K/BB has been dropping fairly steadily, his LD% has risen, his K/9 has plummeted, and his BB/9 keeps climbing. For whatever reason he hit an early decline and its only going to get worse. He wasn't worth much more than the 17 million he earned last year and if he doesn't reverse this trend he`s going to end up weighing down the Mets payroll in coming years. Its only a matter of time before he gets hurt and misses a good chunk of a season as well. No matter how Hughes, Jackson, and Kennedy do, unless Johan can bounceback, the Yanks were smart in their restraint. With the Sabathia signing, they got a better pitcher anyway and are in a better position for the future. I have been a clubhouse manager in the minor leagues for 20 years, the last four employed by the Yankees. For many years I worked for the Canton/Akron AA affiliate of the Indians. to deal with the ramifications of this tragedy, and to do my best to raise my late sister-in-law's son. Two years ago Phil Hughes was the most prominent player on my team in Trenton. I've never been much for collecting autographs, but toward the end of that season I figured I could ask Phil to sign a couple of balls for me that I'd auction off for the local domestic violence shelter. Phil was happy to oblidge, but about ten minutes later he came back to me saying, "Tonto, the balls are only going to bring about $50 each, but I've got some other stuff that would be pretty good." By game time that night he had loaded up my desk with game used hats, gloves, spikes, photos...all signed. I raised a little over $2600 which at Phil's request we split between the shelter and a local Trenton youth baseball group. Last year I collected what I could throughout the season and did the auction on Ebay, raising a little over $5000 for the shelter, much of it on some great stuff Joba signed for me. This year I hope to do better, and am asking you to drop a plug and link for the auction on your site to help me do that. We both know that there are a lot of unscrupulous characters out there, so if you are thinking about helping me with a plug but have a concern, please let me know and I'll be happy to provide a contact with the shelter, and the Trenton Thunder who can verify that this is 100% legit. 100% of the profit from the sale of the items goes to the shelter, and each item comes with a certificate of authenticity from the Yankees AA affiliate Trenton Thunder. Here are a few pertinent links. You may note that the team and the shelter have already posted links to the auction on their sites. I began listing the items a few days ago and more will pop up in the next few days. The bidding will go through approximately November 20th. Among the many Trenton Thunder related items I have some great signed bats and balls from premier prospects of other teams, along with a few items signed by Duke Snider, Joba, Tino Martinez, Jim Rice, Roy White, Ohio State head football coach Jim Tressel, and a beautiful bat signed by Reggie. Any plug/help would be deeply appreciated. If you have any questions, please e-mail me or give me a call (330-224-3660). Help out a great cause and pickup some Autographed Yankee gear in the process! Jake Peavy has said that their are only three 3 AL teams he would waive his no trade clause to play for. One of them could be the Yankees. Again, I don't think any trade would be worth it for Peavy. Hughes is probably fighting for a 2009 rotation spot right now and he looked great. He threw 7 innings, gave up 1 run, walked none, and had five strikeouts. This is the second solid start in a row for Hughes. At this point he has to be at least considered for a rotation spot next year.